Hey guys, this is an excerpt out of something I've been working on. It's in progress (will add on more later), but I figured you guys could use the reference information, so here it is! All commercial monofins, DIY monofin information, cutting monofins, and monofin shaping additions. In the bottom of each tail is a fin used to propel the wearer through the water. 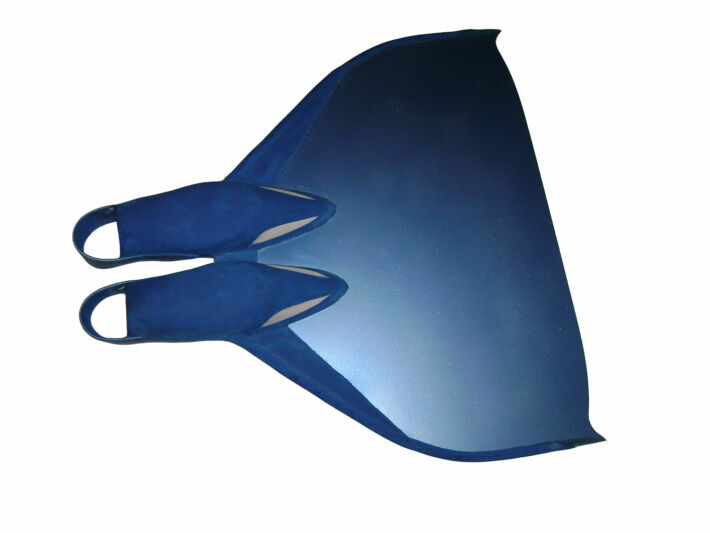 The most common type of fin used in mer tails are monofins. 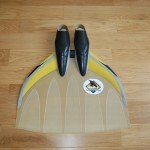 They are a single (mono) fin with a dual foot pocket. 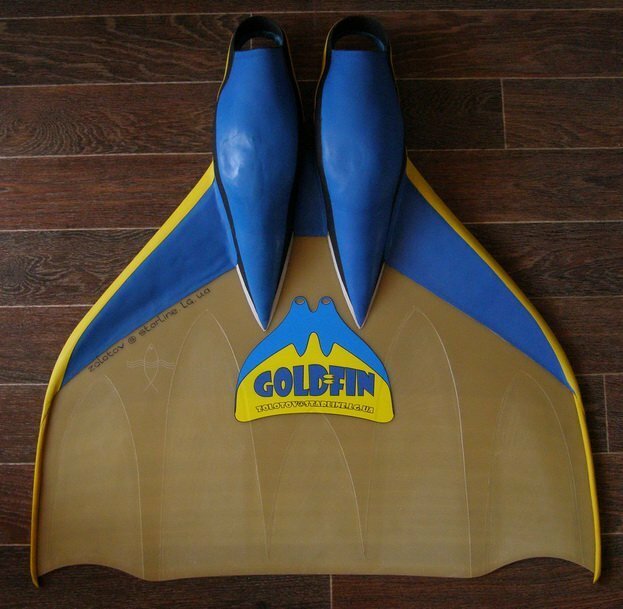 These fins were made for fast and lengthy swimming- mostly for freediving. 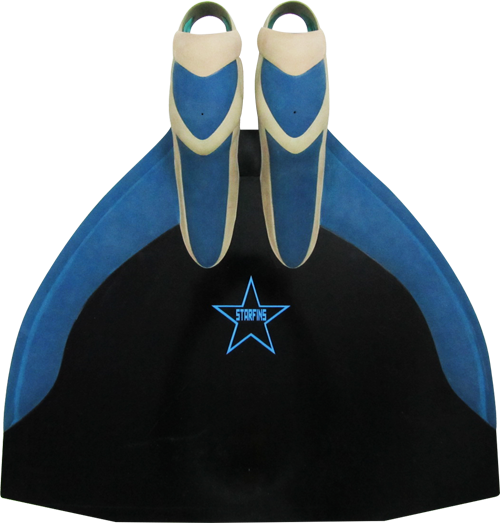 Instead of kicking like you do with dual fins, the monofins use your body motion for the propelling force, like a dolphin kick. It is a fluid like motion that concentrates more around your abs and not your legs- this movement is not only very mermaid like, but is a very efficient one. 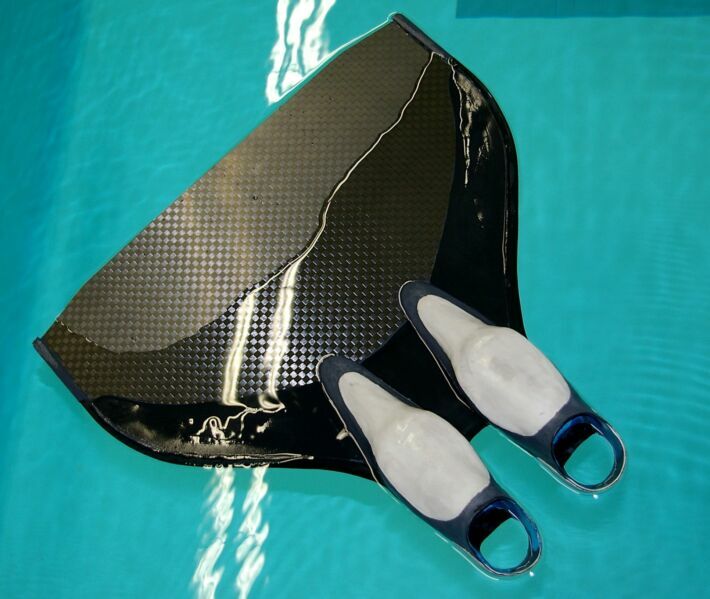 Monofins can be made from a few different materials- mainly polyethelene, fiberglass, carbon, or lexan. 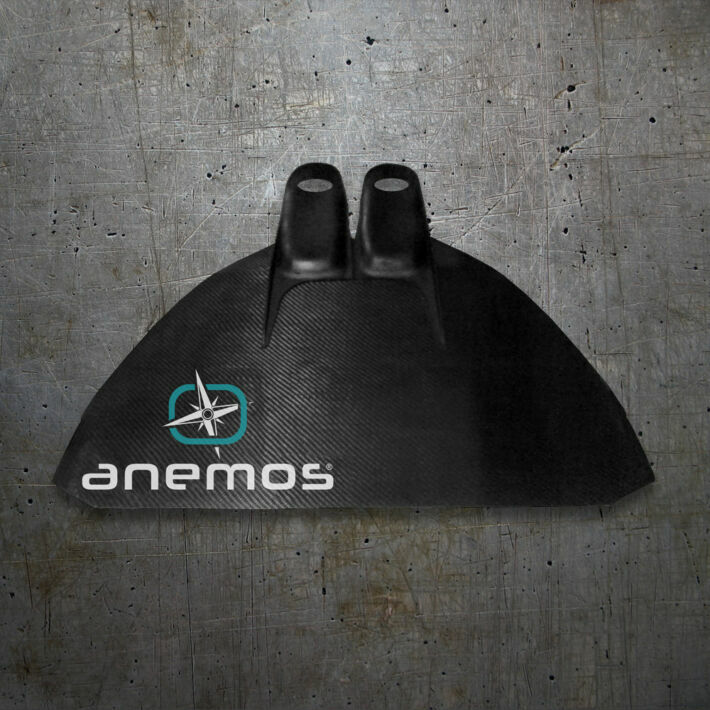 The more stiff the material is, the faster propulsion you can achieve with the fin. 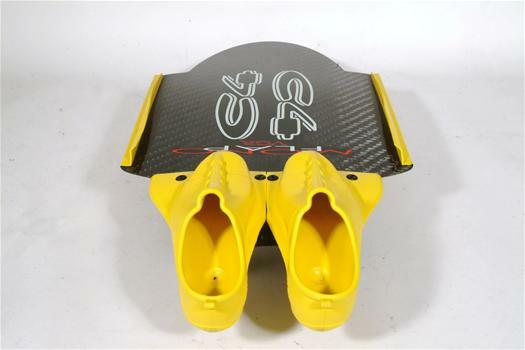 The most popular monofins for mers are the recreational monofins, which are made of a flexible plastic like material called polyethelene or polypropylene, and have adjustable rubber foot pockets. 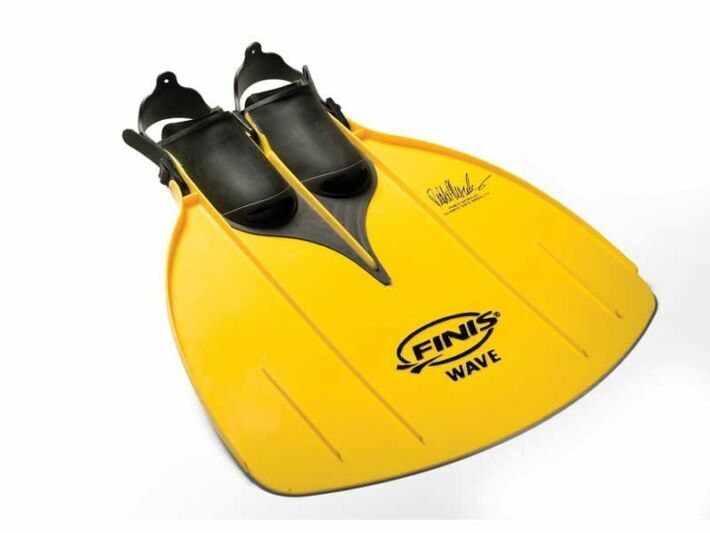 The Wave by Finis is made for men's US shoe size 1-7 or women's 2-8. The blade is on the small side and is less stiff than most. The Rapid by Finis is made for men's US shoe size 8-12 or women's 9-13. The blade is large and stiff. For this reason most recommend the Rapid over the Wave for most tails. 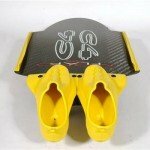 If you wish to use the Rapid but have smaller feet, use aqua shoes or a few pairs of neoprene socks can help with size difference. 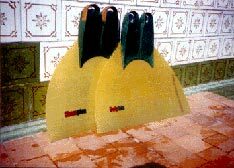 For reference, Finis also use to make a Tempo monofin (sizes 4- 9 ½ F), but it has been discontinued. There are two types of cheaper mermaid shaped fins from finis. One is the Mermaid and Shark fins, by Finis. It comes in pink, purple, and blue; it fits male sizes 1-6, and female sizes 2-7. 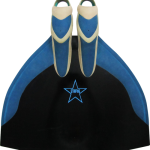 The other is the Aqarius monfin by Finis that comes in blue and pink and fits sizes male 4-10 and female 5-11. The cheaper alternative to the Rapid would be the Finis Foil. 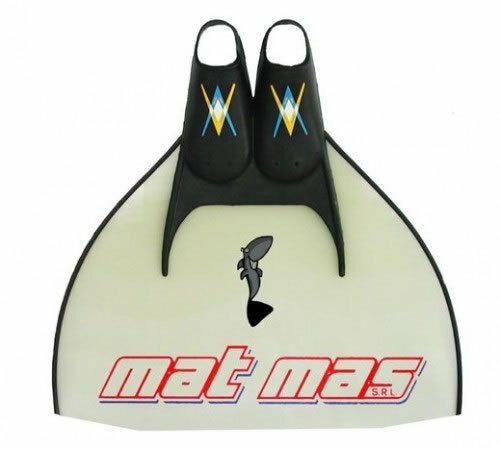 With the ability to order a range of sizes, this fin is designed to fit Men size 3-15, and Women 4.5-17.5. This is a popular option to put in silicone tails so the fluke will have a more flowing movement but still be able to achieve good propulsion. 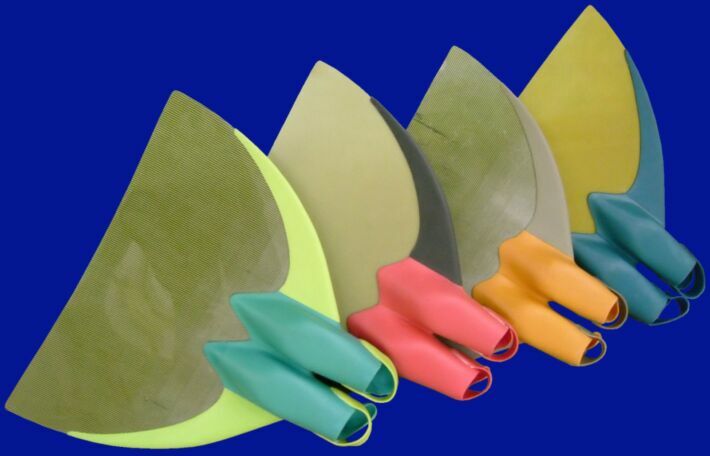 Sweammer Monofins Are polypopylene fins, favored for their smooth (no ridge) and shapely blade. They come in three sizes- the “Triton” sizes for children, the “Hydra” sizes for women, and the “Minos” sizes for men. Also available in 5 colors. 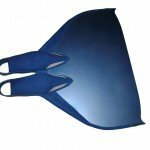 Mahina Merfins- Based out of Australia, Oceanika provides the first monofin specifically made for mermaiding. 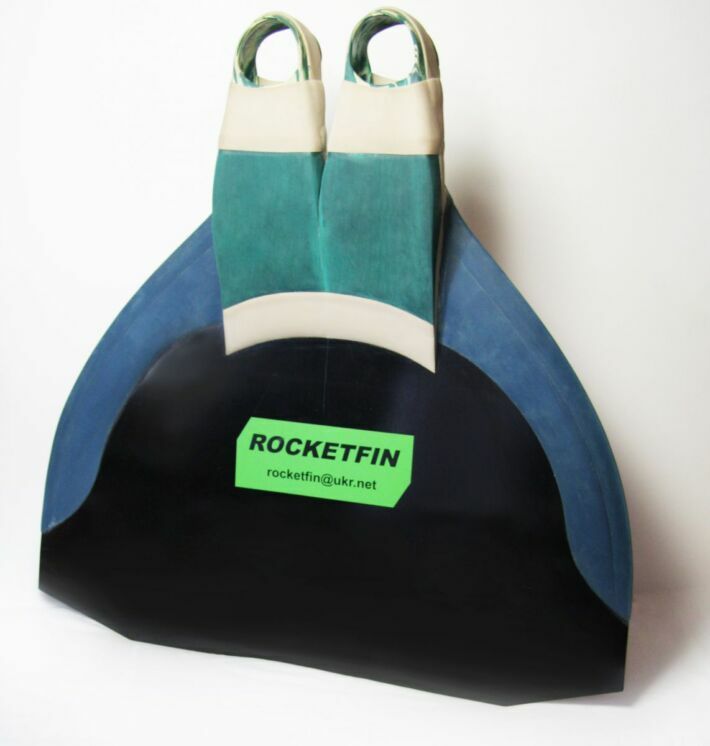 They're eco friendly, made completely out of recycled rubber, and known for their beautiful shape and colors. They are made for both children and adults, ranging from the smallest being able to fit a US size 2, to the largest for a US size 12.5 (please see the sizing chart on their website for more information). They come in teal and orange colors. 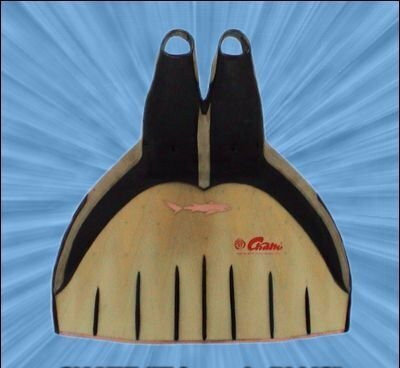 Please note that you now can get adult Mahina Merfins from Urban Outfitters (in the US) with FREE shipping! 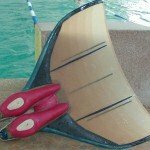 Dol-Fin Monofin comes in once size that will accommodate up to a Men's size 11. Made of carbon, it is somewhat heavy in the water and will not float. Custom Monofins by Victoria are uniquely shaped made-to-order monofins with mermaid shapes, specifically made for mermaiding! They currently come in two shapes, "Classic" mermaid and "Sirena". Finis Competitor by Finis- With the ability to order different sizes of foot pockets, the competitor can accommodate Men's 6.5-16 and Women's 7.5-17 sizes. 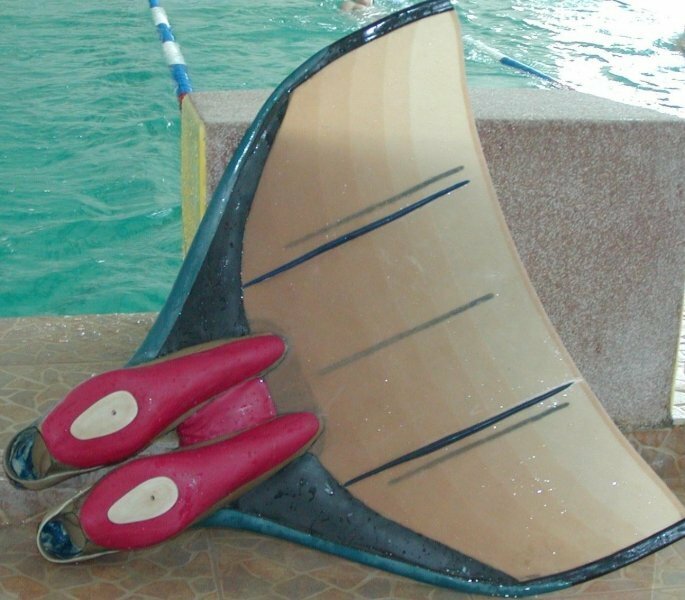 This monofin is made of fiberglass, made to competition standards. 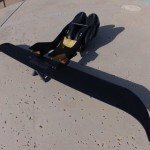 The blade is quite large and very stiff, giving it excellent ability to propel you. 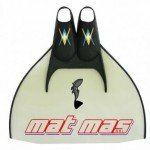 This fin is reccomended for mers who do a lot of open water swimming. 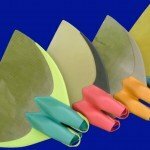 Leaderfins is located in Estonia, and offer a variety of different fins in which you can chose your size footpockets and softness of the blade. 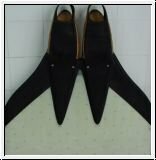 They are a good choice for a realistic look inside of a tail, as several of the monofin's foot pockets taper down to the blade, giving it a more seamless and less bulging look. 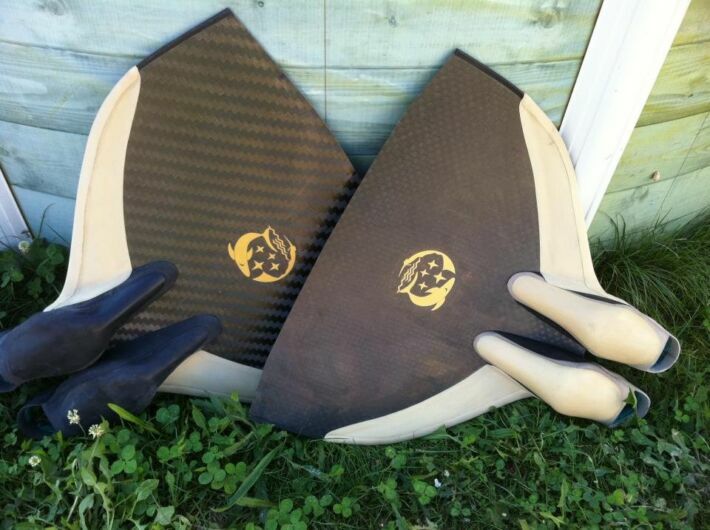 Specialfins is located in Estonia, and provides affordable alternatives to the competitor with a choice of size and softness of the blade. 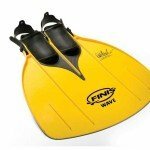 Finis is currently the only monofin maker in the US. However, there are many different monofin distributers throughout the world. 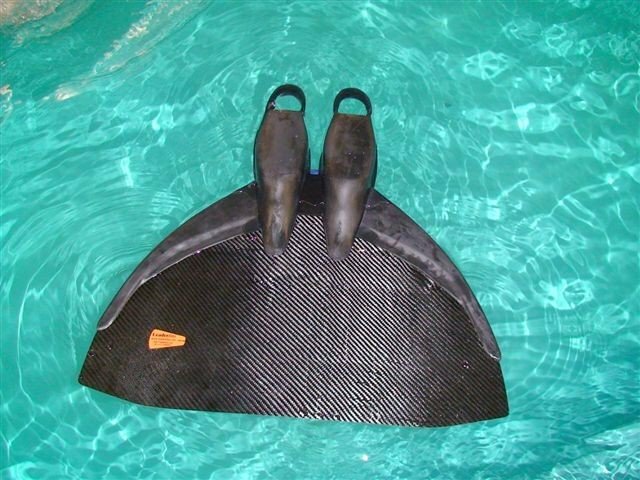 Often there are more choices and the blades are far more customizable outside of the US, since finswimming is has many serious enthusiasts and competitors. Here is a list of some of the options for other monofin sellers, taken from an article in Finswimming Magazine. It is a translated article, so forgive the slips in translation. 1) BINFINS Binfins are Chinese Monofins built by Chen Bin [INTERVIEW], former World Champion in Underwater Races. He has some web sites such as http://www.binfins.com and http://www.chen-bin.com/. Some people are glad to work around the shape of monofins, others like to cut theirs to shape. Polyethelene can be cut with sharp sissors or a raxor knife. Fiberglass monofins can be cut a dremel, bandsaw, or jigsaw- be sure to use proper safety equipment, including eye and nose/mouth protection! Be sure not to cut sharp edges into your the blade, but instead round ones- cutting sharp edges will lead to tears in the blade later down the line. The reason for this is stress concentration at a corner- basically things are more likely to crack or tear at a sharp notch or inward corner because stress is concentrated there (such as package that has a small cut in the plastic to make it easier to tear there). The correct way is shown on the left, the incorrect way on the right. If you have already have a tear or crack in your monofin, you can stop it by drilling a hole at apex of the crack. 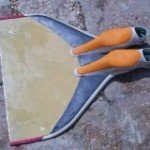 Some people chose not to shape the the monofin by cutting it, but rather by adding additional material to extend it to their preferred shape (example video here). 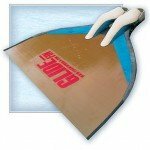 The most common way of doing this is to either attach vinyl or sheet rubber. Some attach the rubber by glue, others by sewing with fishing line or other highly strong thread. The important thing to remember is that you must either completely seal (watertight) the rubber to the monofin, or leave plenty of space in the bottom, via holes/gaps in glue or stitching. 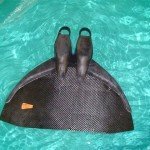 This is because as water flows in and/or through the fabric it can become trapped in the rubber insert, greatly weighing down the fluke as you swim or try to lift it out of the water. Holes allow the water to flow freely in and out of the rubber, fixing the issue. A water tight seal of course would avoid the issue, although with the natural ridges in most monofins this may be difficult to accomplish. Mermaid Moonflower made a terrific tutorial on how to do a monofin extending mod! There is also the option of making your own monofin. There are a few sites and some information on how to make custom monofins, but nothing extensive. 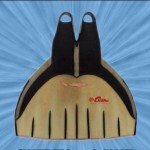 Most people would much rather buy a commercial fin than go rounds of trial and error with materials. One thing I highly suggest is to do extensive testing before you glue them in any tail. 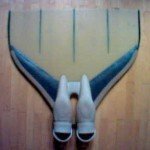 I have seen people that seem successful in making a custom fin, only to find out that somewhere down the line (from the 2nd time of usage to a month or two later) the monofin fell apart or cracked due to a stress point (which would be a design flaw). 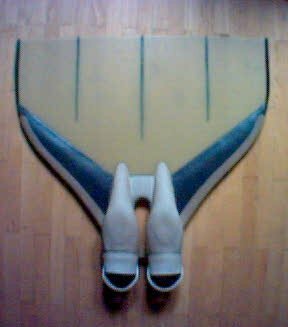 The last thing you want is to glue a fin in a tail you spent lots of time, energy, and money on only to have it fall apart or break in the tail and not have a way to get it out. 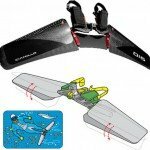 Here we will compile all the information we can to help you to build a sturdy monofin successfully. Lexan (polycarbonate) is the preferred material of choice for homemade monofins. It is durable and clear, making it preferable for those with sheer fabric or people looking for translucent or transparent flukes. Sheets of Lexan can be found at hardware stores such as Lowes or Home Depot. Making monofins out of PVC is not recommended, as it stress fractures (not durable). NEVER MAKE A MONOFIN OUT OF ACRYLIC/PLEXIGLASS- it will snap and/or shatter into razor sharp pieces, leading to severe injury! Monofins need stiffeners. These are needed to to stiffen the blade to reduce bending forces at the footpocket and to increase the power of the kick. The more force that bends the blade, the more force transmitted to the wake and the faster you go. You can make stiffeners by layering material on lexan monofins. They can be adhered together by solvent welding with methelene chloride. You can cut Lexan with a jigsaw or bandsaw for coarse/general cuts, and router for finish cuts, then sand to smooth after. Jigsaws can bog down and get hot in Lexan and begin to melt the chips leading to nasty looking cuts. Use a new blade every time you start a plastics project, and have several extra on hand to swap out if the blade begins heating up. 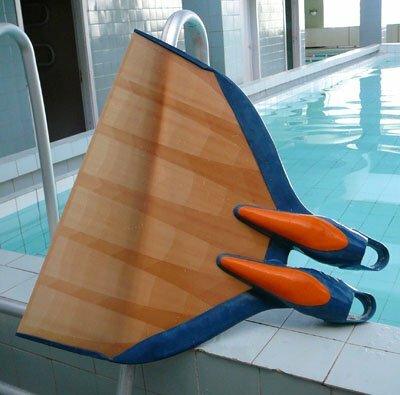 For more information on DIY monofin making, look at the design for Capt Nemo's Titania Monofin. There are sites around on how to make custom monofins, but nothing extensive. 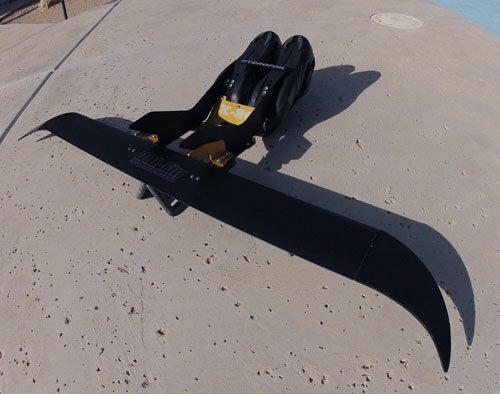 Most people would much rather buy a custom monofin than go rounds of trial and error with materials. One thing I highly suggest is to do extensive testing on the monofins before you glue them in any tail. 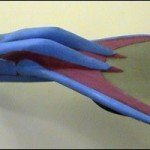 I have seen people that seem successful in making a custom monofin only to find out that somewhere down the line (from the 2nd time of usage to a month or two later) the monofin fell apart or cracked due to a stress point, which would be a design flaw. 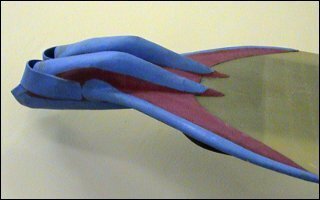 The last thing you want is to glue a fin in a tail you spent lots of time, energy, and money on only to have it fall apart or break in the tail and not have a way to get it out. 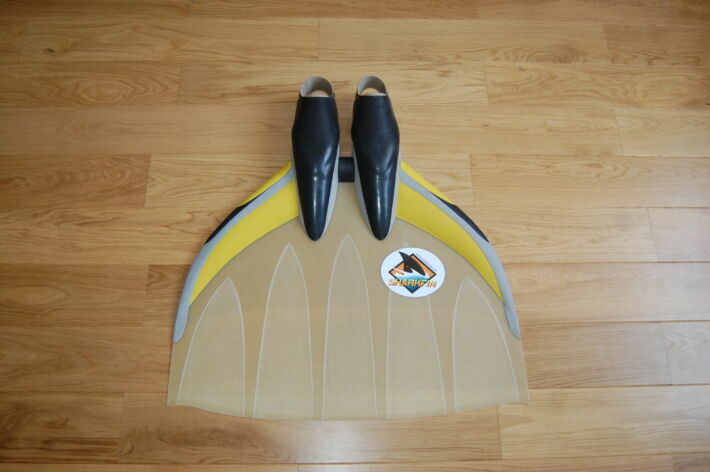 Regular bifins can be used in a tail, but they are not as athletically pleasing, and less efficient for propulsion. The vast majority of mers prefer to invest in a monofin rather than using bifins. Provided your monofin is not glued into your tail and is made of polyethelene or rubber, it is easy enough to get it in and out. Simply roll down the body of the tail to the fluke, reach in and grab the opposite edges of the fin and roll them in on themselves to roll the monofin blade into a tube like shape. Keep a hold, and pull it gently out of the fluke opening. To put in, roll down the body again, roll the monofin up as before, insert into the fluke hole, release so it unrolls, and adjust to desired position. hi!!! 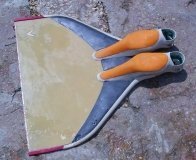 im making a monofin with lexan , i took a photo of what i did caus i so not sure if im heading in the good direction so i need advice. 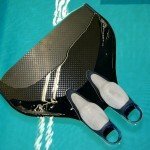 the heal of the swim fin is positionn at the beginning of the lexan but after watching a lot of photo im wondering if it ok. i did not cut the lexan yet please help!!! what is solvant welding with methelene chloride? where can i buy it? 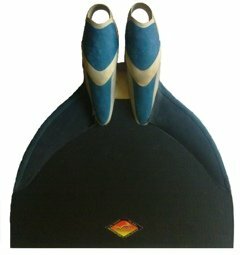 Dol-Fin Monofin (http://www.dol-fin.net/products.html) comes in once size that will accommodate up to a Men's size 11. Made of carbon, it is somewhat heavy in the water and will not float. Great list, but I saw something off. 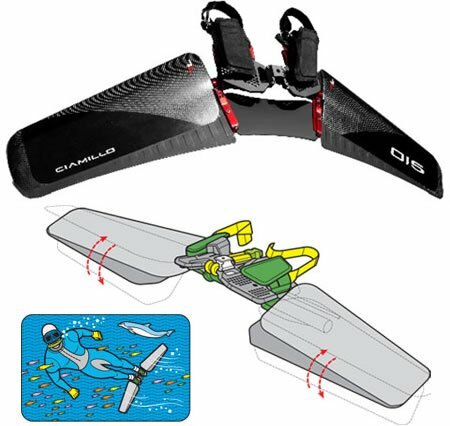 I have this monofin and I can tell you it's made of rubber and not carbon, on land it's heavy but in water it isn't, it's almost weightless. And I really do advise everybody using this one to use socks or neoprene toes as you might get blisters on top of your feet. Need a logo? Website? Business Card? Or anything else? "You are anything but ordinary, why look it?" E-mail or message me. 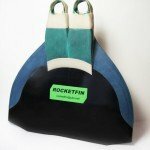 Do you have adviced for how choosing my monofin ? 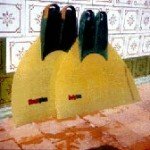 because i don't know wich one is the best : an expensive monofin like for competitor or a monofin for leasure ? Is there a thread for presentation ? User previously known as "Natasha". 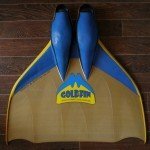 Would a foil fin be a smart choice to put in a latex tail? Hugs, fishes, and mermaid kisses! Thank you so much for posting this. 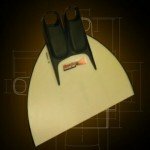 I found a mono fin I love so much better for 1/3 of the cost of the finis competitor! By the look of the monofin I just might have to invest in one of those or even a hydra monofin. 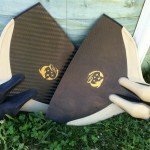 I've got a question for anyone who has purchased a Competitor monofin from Amazon! Unfortunatley there is nowhere in Australia that stocks them (or has them in stock) so the only place I can buy it is from Amazon; the issue is, it doesnt state the hardness of the blade!! Has anyone purchased from there and knows what hardness they send? Thanks so much!